Sometimes the things that are the most surprising are the places that you don’t have the highest expectations for. Today we had two experiences just like that. But first, we had ourselves a stop at a place that we already knew we loved: DDD-approved Geraci’s, a local Italian joint in Cleveland Heights, OH. This is a particular favorite of Holly’s, as I surmise she’d be perfectly content spooning the marinara into her mouth as an appetizer. The next stop was the house of President James Garfield at the James A. Garfield National Historical Site. What began as a random stopoff to learn a little about a random president quickly turned into a 1.5 journey of exceeded expectations. And nothing starts off a tour like a sweet video! We learned that James Garfield was an egotistical child that might have passed for emo these days with his moody diary entries about the thunder burning within him. We also learned that he has a pretty sweet house. It was from this house that the very first “front porch campaign” was conducted. Inside the house was an array of ornate décor and actual non-replica things. I’ve never seen such a display of preservation, and I made sure the tour guide knew how much better his tour was than the Harry Truman house. Needless to say our group was quite happy with the site, and our tour guide informed us that his gift shop HAD been beating the Harry Truman gift shop in sales. Another surprise today was our sudden bathroom break in Westfield, NY. Remember the story about the little girl who wrote to Lincoln telling him he should grow his beard out? 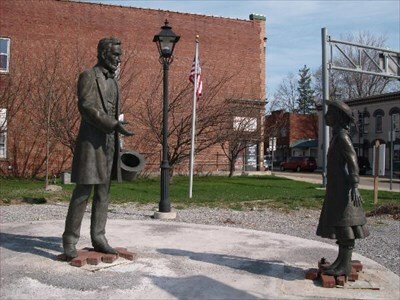 The story goes that Lincoln took her advice, and when campaigning managed to meet the little girl. I never knew where this was until we accidentally found the monument celebrating it just a little ways down the road from the Welch’s plant in the “Grape Juice Capital of the World”. What else did we learn today? If you’ve never eaten at a Checker’s, don’t bother. This is my advice. Tomorrow is a day I’ve been waiting for for a long time. It’s the Baseball Hall of Fame. Can’t wait to share some pictures!